Daily Lenses 1-Day Acuvue Oasys A contact lens just like our tear! Daily silicone hydrogel contact lenses with double protection. Color dye and right and reverse indicator, that is, better visibility in the blister and easy handling. With these daily 1-Day Acuvue Oasis lenses in 90 format you will have lenses for 45 sunsets if you have the same graduation in both eyes, otherwise you will have to buy two boxes with the graduation of each eye and you will have 90 sunsets. Using them daily 45 or 90 days. The new lens manufactured by the prestigious laboratory Johnson & Johnson , is a daily silicone hydrogel lens, (Senofilcon A), which corrects the myopia and hyperopia, and apart from having the properties of the hydrogel, to pass more oxygen to the cornea, to obtain a whiter eye and more hydrated for more hours, incorporates as a novelty Hydraluxe technology , making these lenses have properties similar to our tear, thus improving its function, and providing a prologue comfort throughout the day. These lenses are especially indicated to users of digital screens and to users exposed to adverse agents such as air conditioning. These factors cause the tear of the eye to be very dry, which is why, thanks to the protection of these lenses, these factors produce less visual fatigue and more performance to take the lens longer. In Prodevisión you can acquire Acuvue Oasys daily lenses easily, comfortably and at very competitive prices, enjoying all the purchase and security guarantees. We are a serious company with many years of experience in the world of optics (contactologists, we adapt lenses daily in our center). We are professionals. 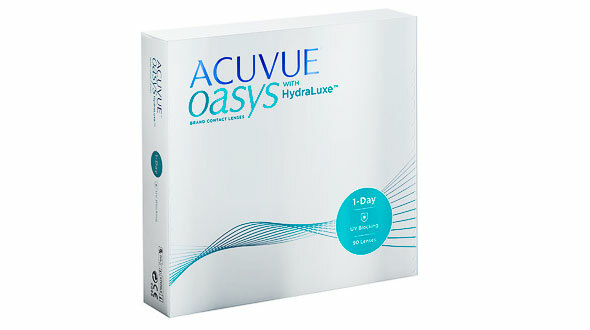 When ordering your Acuvue Oasys daily lenses in Prodevisión, it is necessary that the lenses have been prescribed by an Optical Vision specialist or Ophthalmologist, from there, you must place your order by copying the parameters of the last box of daily lenses that you have acquired , that is, the first adaptation has to be done by the professional who will assess vision, movement of the lens in the eye and also teach you the correct handling and maintenance of the lenses. The Acuvue Oasys daily lenses are for single use, that is, they are placed in the morning and they are thrown at night, they should not be reused, since, being very thin materials, they can handle very little and can be broken when manipulated or even inside the eye.